It should come to no surprise that I follow quite a few members of the Blythe community on various social media platforms. 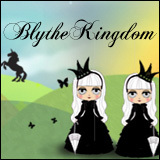 Through people whom I share a common love of Blythe for, I’ve been exposed to other aspects of their collections. Beyond Blythe there are ball-jointed dolls, Monster High/Ever After High dolls, handmade designer plush, faux taxidermy, Funko Pops, and Disney animator dolls. And probably a whole slew of dolls that I am neglecting to remember at this very moment. With a fair bit in common with many of the online friends that I’ve made (because, lets face it, Blythe brings many of us together!) 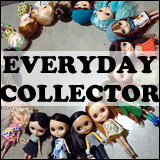 with similar hobbies or fandoms, I’ve found myself being drawn to certain other aspects of the collectible doll world. My most recent acquisitions have not been Blythe, although I am impatiently waiting for Devi Delacour to arrive in October, but Funko Pop. I could not resist when I saw the Sailor Moon collection pop up in photos on Instagram. I definitely resisted for a long time (I still very much want some of the Harry Potter Pops), and luckily they’re not as expensive as Blythe can be (but they do add up!). It’s nice to be able to get something new and not have to wait for it to arrived via post. On the other hand, there is less of a thrill with not repeatedly checking the tracking number for updates, and it’s also not a new Blythe. Blythe is always going to be my first love when it comes to collectible dolls (or figures, as the Funko Pops are), but it’s nice to have a little bit of variety in the collection because it increases the overall level of ‘cute’ that I have in my life. Who wouldn’t want that? Cameo’s wearing: helmet/Cakewalk Queen, dress/Plastic Fashion, tights/Endangered Sissy. 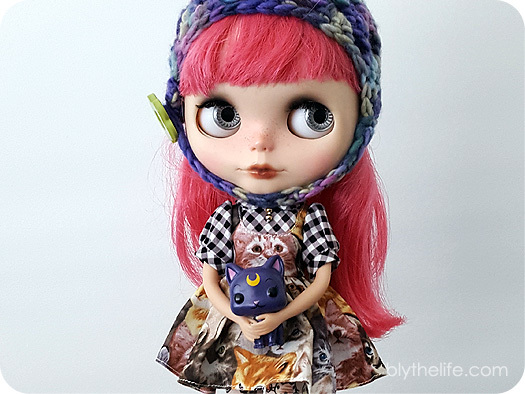 QOTW: Did Blythe lead you to other hobbies? Although I consider myself more enthusiast than collector, in addition to Blythe, I have a vintage Tiny Betsy McCall, two Wilde Imagination Patience dolls, a MSD ball jointed fairy, a Tonner Deja Vu doll, an artist made stuffed frenchie, an artist-made Frodo soft sculpture (and plan to get a dragon to go with him shortly), and two tiny BJD critters from Charles’ Creature Cabinet. 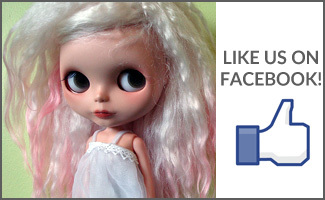 Other hobbies that are off-shoots from the dolls are sewing, jewelry making and digital photography. I’m all over the place, lol! Besides having my Blythe girls, I’ve got 1 Pullip, 1 Monster High doll, a giant tupperware container of Vintage 90s Polly Pockets, a few Funko Pops, and a few Rements. My other hobbies aren’t too doll related, but it’s amazing about all the stuff that I keep.